A variable is a memory location where a programmer can store a value. Example : roll_no, amount, name etc. Variables must be assigned before being referenced. 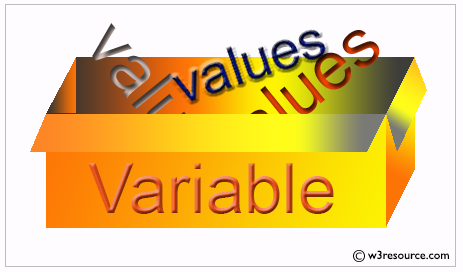 The value stored in a variable can be accessed or updated later. The interpreter allocates memory on the basis of the data type of a variable. Begin a variable name with an underscore(_) character for a special case. One thing is important, assignment statement read right to left only. The basic assignment statement works for a single variable and a single expression. You can also assign a single value to more than one variables simultaneously. Here is an another assignment statement where the variables assign many values at the same time. x, y, z = 1, 2, "abcd"
In the above example x, y and z simultaneously get the new values 1, 2 and "abcd". Python swap values in a single line and this applies to all objects in python.